Many visitors to Turkey feel like don't have time for Cappadocia, but this trip by plane from Istanbul makes it possible to see the area's highlights in just one day. 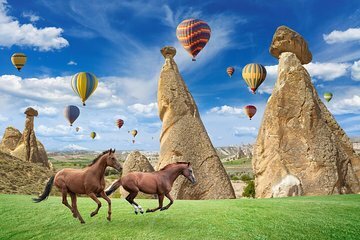 In the "land of beautiful horses,” you'll see Kaymakli underground city, Goreme open-air museum, Pigeon Walley, and Pasabag, hearing guide commentary along the way. Hotel pickup and drop-off, plus all included entrance feels make for a hassle-free day to remember.